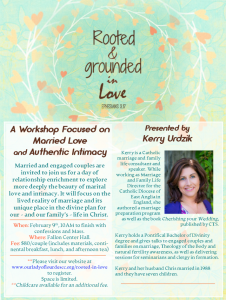 Married and engaged couples are invited to join us for a day of relationship enrichment to explore more deeply the beauty of marital love and intimacy, presented by Kerry Urdzik, a Catholic marriage and family life consultant. Space is limited, and childcare is available for an additional fee. Fee: $80 per couple, which includes materials, continental breakfast, lunch, and afternoon tea. The day begins at 10 am and concludes with confessions and Mass.